Wow, it’s been a month since we spoke, or wrote, ah, read, uh, you know. It’s MARCH!!! I’ve got lots to tell you! 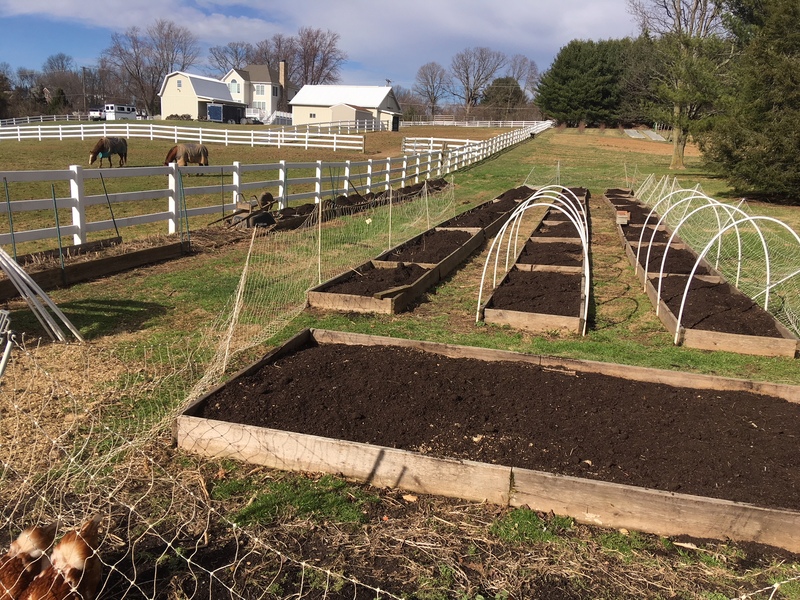 We’ve been working on preparing our raised beds for planting and putting fresh compost on our asparagus beds in hopes to give them a little boost this spring. Our raised beds will be covered this year which should allow us to begin planting a little earlier than we normally could. We have been manuring (is that a word?) our fields this winter and doing some tilling so the soil will be ready to plant when the time is right. The hens have been laying through the winter like there’s no tomorrow. So once again the supply is outweighing the demand. Guess who wins, you! This Saturday from 9-7 all eggs will be $2.50 a dozen regardless of size. I know what’s going to happen, this summer when market business increases 100 fold, the girls are going to say,”Oh, we are worn out from all that work.” and stop laying eggs. I just know it! Our new website should be hitting computers around the world in the next couple of days. If you get a moment, check it out! Still plenty of room in the Chicken CSA. The produce CSA is sold out. We have been welcoming overnight guests to the farm since last July through Airbnb. You can check out our listing at here. If you have visitors this year and not enough room, if you have family visiting and don’t want them in your home or just want a getaway with me cooking you a fantastic breakfast, feel free to give us a try. Our next “School of Crops” session will be held Wednesday, March 21 at 7 pm at the farm. We believe Joan Parris, master gardener, will join us again. We are hoping we will be able to be outside for a bit for the March session. This is the month that we should be able to start planting a few things and we, hopefully, can help you get started in the right direction. We had a nice visit with Mike, Tiffany, and daughters Scout and Harper at their Crooked Creek Farm in Pylesville today. They have started a pastured pork business and wondered if we may be interested in carrying their products in our market. We will keep you posted. We are looking for someone to help around the farm. Looking for: Bright-eyed, bushy-tailed, self-starter, eager-beaver, situationally aware, go-get-‘em, teachable, positive, non-complaining, grateful, rejoicing, get er done, dependable, faithful, perseverant, and take responsibility types of individuals. With an interest in organic farming, self-sufficiency, and sustainability. This is not easy work. You’ll be working outside..a lot. In the hot scorching sun…a lot. Dealing with manure…a lot. Pulling weeds…a lot. Prepping fields for planting, planting, harvesting, cleaning chicken coops, learning what we’re growing and how and why we grow the way we do so you’ll be able to answer questions in the market. The pay stinks just like you will at the end of the day. Sound like fun? Let us know if you’re interested. Any experience would be a bonus. Email or stop by the farm. But wait, it gets even better for you few that have read this entire email. Saturday if you say the secret word which is “BINGO” your eggs are only $2 a dozen. If I’m not in the market to confirm the secret word, you’ll have to honk your horn or ring our bell to get my attention and your bonus.